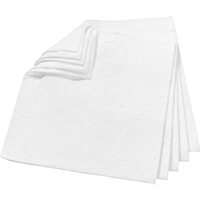 High capacity sorbent pad features a low profile design, so that it can be easily placed in tight areas to absorb oil. Ideal for cleaning up small spills and wiping down contaminated areas. Each bale absorbs 40.5 gallons.